In the Calydonian army archery has been marginal for a long time and the archers, called Toxotai, were used only to defend cities and fortresses. Still recently archery has become more important, mainly because of the experiences of the Calydonian army in fighting well-trained archers. 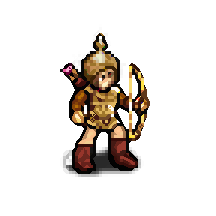 The Toxotai, armed with a bow and a dagger, now represent a considerable part of the Calydonian army. Last updated on Sat Apr 20 01:33:51 2019.